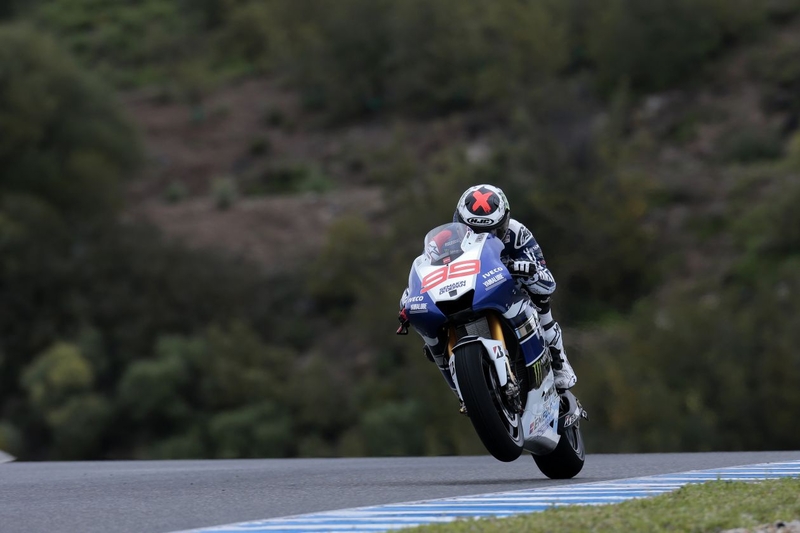 In a repeat of Free Practice 1, Yamaha Factory rider Jorge Lorenzo topped the time sheets after the second 45 minute session of the day for the Spanish Grand Prix at the Jerez de le Frontera in Southern Spain this afternoon. The double world champion was yet again showing his rivals his incredible ability to produce a fast but almost metronomic pace by lapping consistently in the late 1:39s to very early 1:40s almost each time he went out on circuit. Lorenzo’s fastest time of the day 1:39.562s, set early on just lap 4 of 18 laps, was never headed despite the close attention of Britains Monster Energy Tech3 favourite Cal Crutchlow who ended the session just 0.171s shy of the Mallorcan. The session began with Lorenzo leading the way from Crutchlow, Pedrosa, Marquez and a quietly-going-about-his-business Valentino Rossi in fifth. Unusually for MotoGP these five held station for the large proportion of the session with just the top three breaking in to the 1:39s until, with 10 minutes to go, both Marquez and Rossi joined the sub 1:39s club and it was Rossi that posted the better time of the two to secure fourth place in the standings. The top five are covered by just 0.327s which, should that trend continue tomorrow and Sunday, may well see a classic Grand Prix race unfold on Sunday afternoon. LCR Honda’s Stefan Bradl struggled for the most part of the session but, disappontingly, as he’d set his personal best times through the first three sectors he lost the front of his Honda RC213V in the fast right-handers at the back of the pits, fortunately though neither the Honda nor Bradl dug in as they slid through the gravel trap and both escaped with minimal damage. Slightly more spectacular was Came IodaRacing Project rider Danilo Petrucci when his Kawasaki power-plant let go spectacularly in smoke and flames just before the stadium section after just 15 minutes of the session, thankfully without any oil spilling on to the circuit..
Further down the field, Michele Pirro put the Ducati test bike as high as 8th mid-session but settled for a creditable 12th place, the rest of the top ten was rounded out by GO&FUN Gresini Honda’s Bautista, Iannone as top Ducati ahead of top CRT man Barbera and next best CRT in Aleix Espagaro and Nicky Hayden. Next Next post: Crutchlow second in FP2 despite issues with bike.